Three years after Sheriff Travis Walker sent Lacy Milligan to prison for murder, he’s uncovered evidence that clears Lacy’s name. Now the former enemies must work together to find the real killer—and time may be running out. Four years ago Cain Bennett ensured Hayley Green’s arrest, and he’s lived with the guilt of his former lover’s incarceration ever since. Now, though, the people she was once trying to expose are after her—and only Cain can keep her safe. Someone is stalking prosecutor Jane Reise, and she knows she needs the help of irresistible former navy SEAL Sullivan Bishop. A tense shared history has him shutting her out, so she’s forced to blackmail him. As her stalker closes in, they’ll put their lives—and their hearts—on the line. 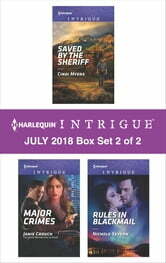 Look for Harlequin Intrigue’s July 2018 Box set 1 of 2, filled with even more edge-of-your seat romantic suspense!